Sunomata Castle (墨俣一夜城, sunomataichiyajo) is a ruins of castle which legend said built by Toyotomi Hideyoshi in 1566. During the war between Oda Nobunaga and Saito clan, It was built over night. After this success, Hideyoshi became very important man in Nobunaga's samurai. Therefore, this castle is considered as the beginning of Hideyoshi's success story. Today, there is reconstructed castle which designed of Ogaki Castle, and there is a museum inside. There is no parking, but restroom. Admission of the museum: 200 yen. 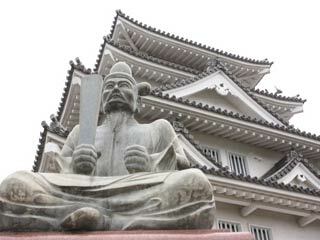 Sunomata Castle is located on the connection point of Nagara River. This castle was built to break the line between west Mino, Ise and Gifu. It appears in "Shinchokoki, the record of Nobunaga," and "Taikoki, the record of Hideyoshi" that Hideyoshi built this castle around 1560's. It was believed that the story of Sunomata Castle was just a fiction, but when "the record of Maeno clan" was found in 1959, it mention the details of Sunomata castle and how it was built. The construction of this castle was the first prefabrication and precut construction ever happened in Japan. Hyotan is the symbol of Hideyoshi. You write your wish on Hyotan and leave it here for your wish coming true.